Please use this link to contact the Cemeteries directly for accuracy on prices. 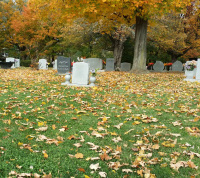 Most Basic Adult Burial aproximatley $1,800-$1950 unless other options are selected, required or necessary for the case. The price is depending on the services that the family selects. Overseas shipping (Approx.) $6,500-$8,100, depending on the country and service options selected. Airfare for deceased is included. Take a tour of our facility with a virtual tour, and see our funeral fleet.